Manual scavenging refers to the practice of manually cleaning, carrying, disposing or handling in any manner, human excreta from dry latrines and sewers. Despite a legal ban on this inhuman practice, shamefully, it is still very much prevalent in the country, and especially in our cities. Manual scavengers are amongst the poorest and most disadvantaged communities in India. Apart from the several health hazards faced by them, the death toll while doing manual cleaning of underground sewage pipes and septic tanks is very high. In Delhi alone, more than 400 sanitation workers lost their lives after being forced to do manual scavenging. With a view to building skills of people at risk of being forced into manual scavenging and empowering them for safer and better livelihoods, ActionAid India, under a European Commission-supported project, initiated a 2-month-long housekeeping training course for 50 former manual scavengers on September 24 in Delhi. 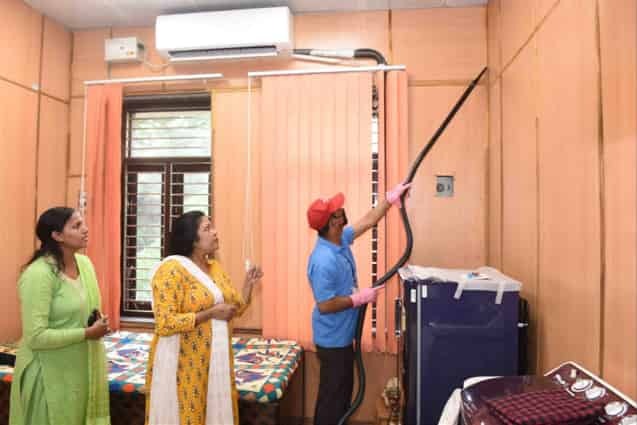 The programme is being run as per the syllabus of Domestic Workers Sector Skill Council, and is being done in collaboration with the office of Sh. Kumar Mahesh, District Magistrate (DM) – Shahdara and Sadik Masih Medical Social Servant Society (SMMSSS). During the training programme, the trainees were oriented on the roles and responsibilities of a housekeeper, the question of dignity, and hygiene. Besides, they were introduced to the various tools for cleaning household appliances and furniture, in addition to the utility and functioning of Personal Protective Equipment (PPE). Practical training on housekeeping tasks as sweeping, dusting, mopping, bed-making and dish-washing was also imparted. In addition, DM – Shahdara and SMMSSS have been assisting trainees to apply for government documents, such as Aadhaar Card and SC certificate, to enable them to avail the various government schemes. Trainees are also being supported to open bank accounts. The DM’s office also organized a medical check-up for all trainees. Under this programme, placement support is also being provided to trainees, thereby enabling them to move towards an alternative means of livelihood and a life of dignity.